Ballpark Broadcasting welcomes Sports Canada TV, its live video streaming partner for a second year in a row. Live streaming video broadcasts will be offered for 50 of 65 games played over the 10 days of the championship. The broadcasts will be a joint venture between Sports Canada TV and Ballpark Broadcasting. Ballpark Broadcasting will provide the play by play and color commentary, while Sports Canada TV will provide the camera and production crew and technical expertise. 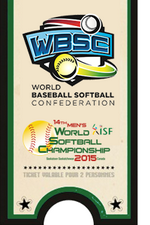 2015 is the second year in row hat Ballpark Broadcasting and Sports Canada TV will be teamed to deliver state of the art, high definition live streaming video broadcasts, of an ISF/ WBSC Championship to a world-wide audience. The in-the-booth broadcast crew of Ballpark Broadcasting at this event will feature a 5 man crew consisting of: Kyle Smith, Lance Winn, Joe Todd, Blair Setford and Jim Flanagan. The Ballpark Broadcast quintet has been together for the better part of a decade and has broadcast hundreds of games to softball fans around the world. The five brings years of experience and knowledge of the men’s international game to the booth. Click ticket stub above or here to subscribe.